Australian couple Kate and Mike met online in 2013. They instantly clicked when they met in person and were smitten from day one. 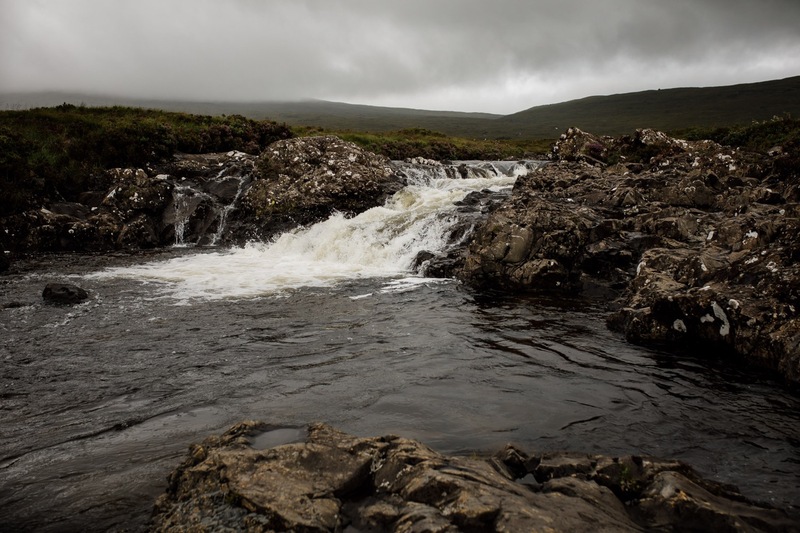 Now they are best friends as well as partners and they decided to venture far from home, to the idyllic Isle of Skye, to make their promises to one another. Here is their story, in their own words, and if you scroll down you’ll see the photographs from their incredible day, plus their top tips to planning an elopement! Neither of us have ever wanted a traditional wedding. We decided to elope because we wanted a wedding day that was special and memorable but also intimate and highly personal. When we got engaged we were in the middle of planning a 12 week Europe trip, so we naturally started checking out options for overseas elopements. 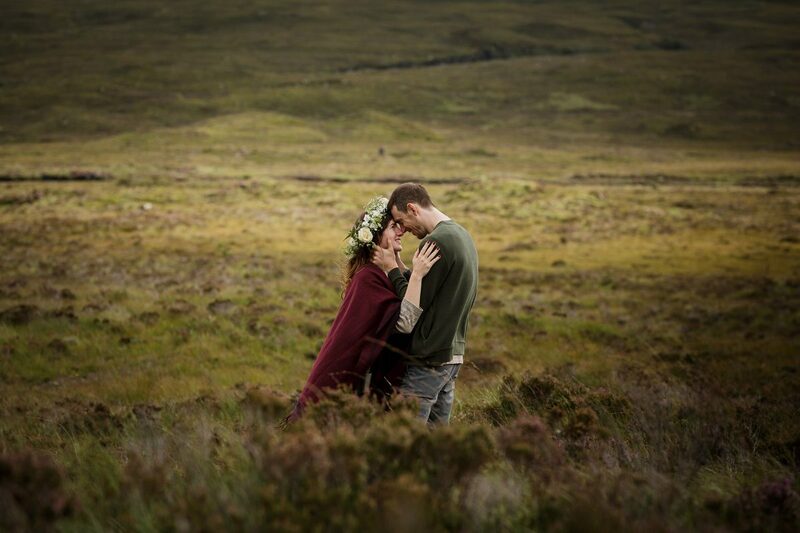 We fell in love with photos of other Skye elopements and went from there. Organising our elopement was so much easier than we expected. The first step was finding a date when Lynne and our lovely celebrant Penelope Hamilton were both available. They were both extremely helpful with explaining the process, recommending other vendors – including our fiddle player, Donald McKenzie, and Donald from Loch Duich plants who made Kate’s crown – and exploring location ideas. That meant we could focus on the fun stuff like choosing our outfits and writing our vows! We had a perfect day. It was exactly the wedding we wanted – in fact, we both underestimated how meaningful the experience would be. Everyone involved was incredibly friendly and went out of their way to ensure everything went smoothly and we had a special day. One of our favourite parts of the ceremony was the surprise vows we’d organised with Penelope. We wrote most of our vows together, but we each separately sent her a list of three things we love about each other. We heard each other’s love list for the first time during the ceremony and it was really sweet and moving. We had a great time exploring and soaking up all the natural beauty with Lynne and she made the whole shoot feel easy and natural. Plus, we found that spending a few hours hugging and kissing your new spouse is a great start to a marriage! Lynne emailed us a selection of her favourite photos that same night, which was a great idea as we could share them with friends and family back home straight away. 1. Pick accommodation that will suit the occasion. We stayed at a beautiful Airbnb with lovely hosts George and Jamilah, which was a wonderful decision as they were very supportive and really went the extra mile to help us celebrate our special day. You can’t know in advance if you’ll strike it lucky with your hosts, but you can definitely plan ahead regarding things like ensuring your accommodation has ironing boards, bathroom space, and scenic areas for your getting ready photos. 2. Plan ahead. Even though eloping is much simpler than coordinating a full wedding, there are still things you’ll need to sort out and the better organised you are, the more relaxed you’ll feel on the day. Make sure you’re on top of the legal requirements well in advance – the local registry office is happy to answer questions! 3. Be mentally flexible regarding weather. We arrived just after a massive heatwave – apparently everything had been quite dry and sunny! It rained heavily most days we were in Skye and we were quite worried we’d get rained out. Lynne and the crew were very flexible about timing the ceremony to fit the weather, and diligently checked the ever-changing weather forecast in the lead up to our wedding. We were very lucky and ended up getting perfect dry yet misty Skye weather. With that said, we could’ve just as easily been sunburned or rained on – be prepared (emotionally and logistically) for all sorts of possibilities. 4. Enjoy the day! One of the great things about eloping is that it’s all about you and your new spouse. The ceremony/photography doesn’t take up the whole day, so you’re free to fill it with hiking, dining out, or anything else you’d like to do.